Did you know that 45,500 tons of food waste ends up in the Sonoma County landfill each year? 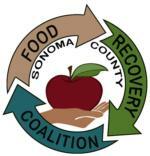 The Sonoma County Food Recovery Coalition (SCFRC) is committed to reducing food waste in Sonoma County by building community connections and resilience. Here you can learn about reducing food waste and making connections for donating food for people in need. Do you want to donate or receive food? Do you want to learn how to reduce food waste?